What Is Integrated Pest Management, And Why Is It Important? According to the University of California, integrated pest management (IPM) is an ecosystem-based strategy that focuses on the long-term prevention of pests and pest damage through techniques such as biological control, habitat manipulation, modification of cultural practices and use of resistant plant varieties. At Earthwise Pest Management, we practice the application of integrated pest management not only because of the tactics’ effectiveness at managing pests but also because the use of IPM minimizes health risks that are usually associated with the application of pesticides. Overall, IPM is the most practical and effective form of managing pests in both the Sacramento area and all around the world. At Earthwise Pest Management, we employ the practices of IPM in both residential and commercial pest control projects in the Sacramento area. 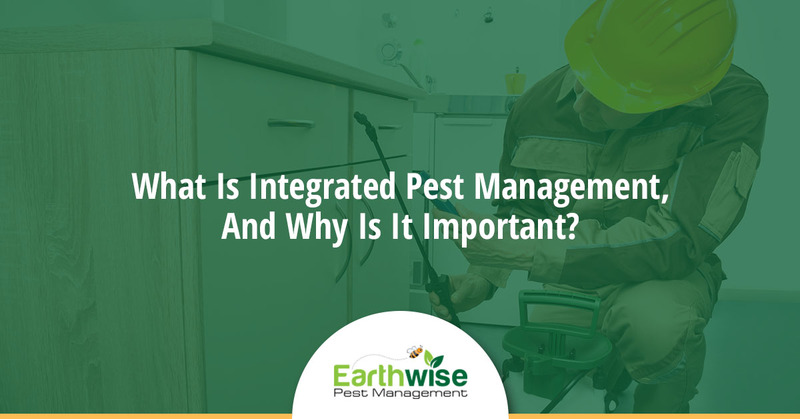 Now that you know what integrated pest management is, let’s dive a little deeper into how it works! IPM focuses on the long-term goals of pest prevention by managing and influencing the ecosystem within your home or business. An example of an action that a commercial property owner could take to promote IPM would be caulking cracks or gaps in the building in order to keep rodents and insects from entering the building, a practice known as pest exclusion. Homeowners may also take actions towards promoting IPM in their homes and on their properties in ways like planting insect-repelling plants in the yard and near doorways. Identify your pest problem. This is the most important step of the IPM process because, in order to treat pests with minimal environmental impact, exterminators must know what methods of treatment will work best for that particular pests. Call us at Earthwise Pest Management. Whether you need help identifying the pests infesting your property, or if you simply want us to take care of your pest issue with our pest control services, we are happy to help. Check your property for the pest’s point of entry. In order to successfully implement IPM in your home or business, it’s important to keep pests from entering your building. Inspecting the exterior of your home for damages or small gaps where the pests could save you a ton of time in the long-run. Once you find the pest’s point of entry, be sure to use caulking or some other method of blocking the points of entry to keep the pests out. Find the pests source of food and water. Pests enter your homes and business in search of food that they don’t have access to elsewhere, so eliminating or securing the food or water in your home or business can ensure that the pests don’t find your property desirable. Continually maintain your property. Once you find that the pests are gone, it is crucial that you maintain your property to keep pests from coming back. Doing things like regularly inspecting your building for damages and keeping the building clean will make pests less likely to return. There are four major actions within the proper practices of IPM but in order to effectively manage pests over a long period of time, a combination of actions should be used. Using biological controls are an important application of IPM. Biological controls refer to the use of practices such as planting pest-repelling plants, using pathogens or parasites, or even introducing a predator that could control your pest issue naturally. A cool example of a predator of pests is the praying mantis. Some people use the praying mantis as a form of biological control in their gardens because they are a predator of common pests. If you do seek methods of biological control like introducing predators, be sure to contact the county or a pest control expert to make sure that the predator you are introducing is not a non-local invasive species. Cultural applications of IPM refer to the habits that we have that restrict the populations of the pests. Once pests enter your home or business they reproduce and disperse. An example of a cultural habit that can be tweaked to suppress the wellbeing of pests in your home is cleaning. Cleaning more regularly can effectively get rid of pests by taking away the living conditions that pests require. Physical controls of IPM are the controls that directly kill pests or keep pests from entering a home or business. A physical control that restricts the movement of pests would be barriers like screens or netting that keep insects from being able to move freely. Mechanical controls are also a form of physical control and are most often found in the form of traps. This form of control is the most commonly used form of pest control. Chemical controls like pesticides are extremely effective at eliminating infestations of pests and are commonly used by pest control services. While pesticides are effective, they can be damaging to your health if used in large quantities and often. In order to reduce the number of pesticides needed for pest removal, it is important to also practice biological, cultural and physical controls as well. Earthwise Pest Management, Your IPM Professionals. At Earthwise Pest Management, we proudly serve the Sacramento area with quality pest control that will not only get rid of the pests but keep the pests away for good. By following proper IPM guidelines, we can ensure that not only will your home be pest free but it will also stay pest free because, at Earthwise Pest Management, we care about the long-term effects of our business. Contact us today for a free quote, and let us show you why IPM is the most effective way to keep your home pest-free.